High-density weapon storage on a moving aisle system is an effective and popular way to increase arms room capacity. Proper design, material selection, and system configuration are critical to long-term performance. There are trucks and there are cars. Both are very good at doing what they are designed to do. A 1-ton pickup truck with dualies will easily carry huge loads and lots of people and/or gear over rough terrain, but will struggle when a mom with 3 kids is trying to park at the grocery store. Vice-versa for the Toyota Corolla. 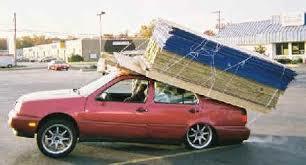 Big problems occur when you start trying to use the Corolla to haul 40 sheets of plywood. The same thing holds true for high-density weapon storage solutions. It is critical to purchase the system that meets the performance requirements of the application. SecureIt has been brought into many armories to fix failed weapon rack systems. Often the cause of failure can be attributed to the installation of a high-density system that was not designed for military environments. The fault in cases like these should not be blamed on the system itself, but rather on the shoulders of the people who recommended, designed, sold and installed it. The image above shows a broken end panel, This system had particle board laminate end panels. These work fine in a museum or medial office environment however they fail quickly in an armory. Military system must be all steel. Lack of experience is the root of all evil in military weapon rack systems. Real armory design and building experience are not easy to get. Most civilian contractors are hesitant to look at military bases and facilities as a source of knowledge. If a salesperson is not comfortable with the setting and does not know how to gain access, he or she will simply focus his selling efforts elsewhere. When the sales rep’s phone rings and a military unit needs a new weapon rack system, that salesperson will gladly go write the order. The sales rep will evaluate the need, look at the weight load and recommend a system that seems to fit the requirements, all based on previous experience with office and filing storage. In many cases that salesperson is unknowingly making critical mistakes. See: Evaluating Competence. Most high-density storage salesmen simply do not know what a proper military weapon storage armory is. It is not the same as a hospital, law or records office, where they spend most of their time installing mobile aisle systems. In a military armory, it is not as much about weight and total load as it is about impact. A tractor-trailer rig can move very heavy loads over smooth roads but will fail quickly on a rocky, off-road excursion. Consider military armories as an “off-road” application. 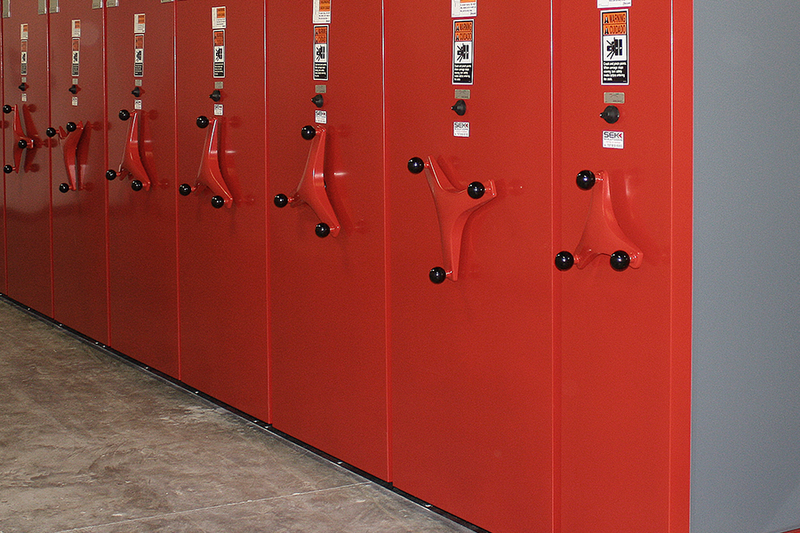 Military armories require heavy-duty, high-density systems with all steel components and end panels. Decking should be rubber or VCT tile – never uncovered plywood. A mobile aisle system consists of steel rails (tracks) mounted to or embedded in, the floor. Steel carriages holding weapon racks, shelving, modular drawers etc. roll on these tracks. Shown here is a typical military armory where the growth in weapons and gear exceeds the arms room’s capacity. Here weapon racks are configured in rows with narrow aisles – perhaps just enough space for one person – between them. There is barely room for the armorer’s desk. This is a tight, difficult space in which to work. 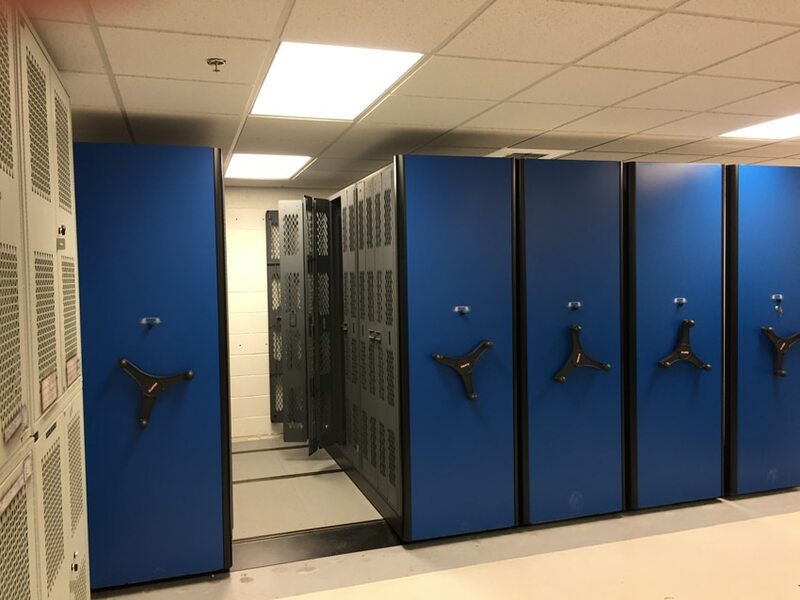 This is the same arms room where the weapon racks have been mounted into a high-density mobile aisle system. By using this system and only creating an aisle where it is needed, there is a great deal of reclaimed space. Now the arms room has two work benches with a modular drawer cabinet between them, and an area with wide span shelving. The drawers may be used for tools, optics, night vision goggles and other gear. The shelving can be used for cases, mounts and other large pieces of equipment. Electric vs. mechanical assist. – !! Use Mechanical only !! There are two types of mobile aisle systems used in armories; electric and a mechanical assist. Electric systems use electric motors to move the carriages, mechanical assist types use a gear driven system with a manual drive wheel that a person turns to move the carriages. Electric systems are complex, require programming and regular maintenance. In the event of a power outage, the system will not work. Battery backup units can be installed, but these will provide only a very limited amount of extra time. Mechanical systems are the correct choice for armory applications. They are simple, low maintenance and faster to operate than electric systems. They also do not require any power. In the event of the power being cut, you will still be able to get to the weapons. Clam Shell or Cube Systems. A cube or clamshell system uses mobile carriages and open weapon racking or weapon storage cabinets without doors. The system is secured by closing the aisles and locking the carriages. The system is set up so there is no gap between adjacent carriages and weapon racks. When closed, the system forms a tight secure cube. Cube systems allow for fast access to large inventories of weapons and gear. These systems work extremely well for security force armories as well as for reaction force and rapid response teams. There are many options and considerations when evaluating a mobile aisle system. It is very important that the storage specialist with whom you are working has a lot of experience with military weapon storage. « Weapon Rack Storage: How Many Racks Do I Need?